"I felt judged for going to church on Sunday." This was one of several authentic admissions made to a group of around 150 students, faculty, and staff in the Fireside Room on Wednesday evening, May 2. The crowd was gathered to hear and learn from the honest perspectives of three current PUC students who did not grow up Adventist. It was the first event in the #YouBelong PUC Talks series, a new concept focused on conversation and discussion. "Last year, student officers created a diversity statement," explains Megan Weems, Student Association (SA) president. "The basic idea is there are no disclaimers from the love, sacrifice, and salvation of Jesus Christ." Looking for something more meaningful than a document, the current SA officers and senators began a plan for productive campus conversations on belonging. "I'm proud of our students for leading and participating in conversations about challenging topics that impact us all," says Bob Cushman, PUC president. "They have demonstrated civil discourse is not out of their reach, and I enjoy observing their interactions as they confront these important cultural issues." Prayer sets the tone of each event, followed by connection activities, panel discussions, and moderated conversation. "There's a difference between tolerance and acceptance," says Alma Musvosvi, SA executive vice president. "We need to move from 'You're allowed to take up this space, to 'You belong here.'" As a student from a minority group, Musvosvi admits it's not easy to have these nuanced conversations with friends. "We want to help people understand," she explains. "If they know, it's easier to point out how what they did or said was offensive. If they know, they can respond in the way we all should: 'I'm sorry; how can I do better?'" 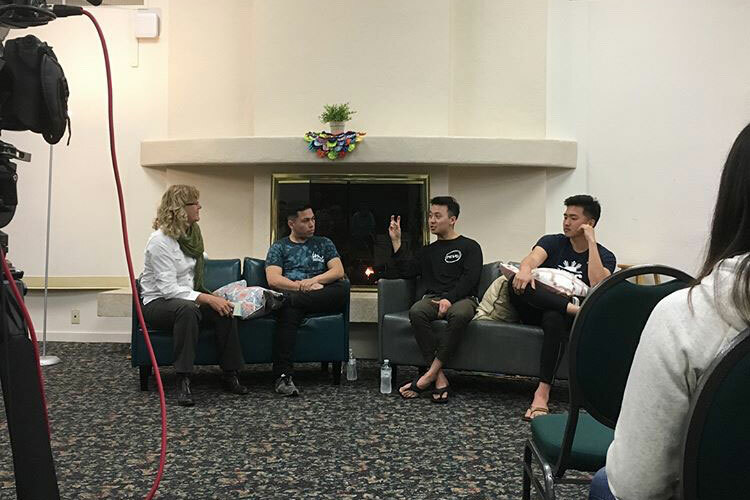 The topic of the first #YouBelong PUC Talks discussion was "Diversity of Faith," and featured on the panel two Presbyterian students and one who grew up Catholic. Tammy McGuire, professor of communication, moderated. So, what's it like to be a Presbyterian at an Adventist school? One panelist admitted it was hard not having the context for many Adventist culture references; for a while he thought Ellen G. White might have been president of PUC. Another said weekends were confusing; the gym was locked on Saturday, and a lot of people were missing and he couldn't figure out where they'd all gone. "I felt judged for going to church on Sundays," admitted one. Another said breaking into pre-made friend groups—such as those who attended academy together—was challenging: "You're trying to befriend a crowd instead of an individual." All panelists agreed they regularly walk on eggshells during conversations with Adventist students, never sure how they will be received. "What would make you feel safer to be who you truly are?" McGuire asked. "This event is a huge step," said one panelist. "It's helpful for people to understand not everyone they meet here comes from the same background they do, that there are different people here, and to take the time to get to know them and understand their perspectives." McGuire ended the conversation with an invitation to the entire group: "Ask each other, 'How can I make people feel safer at PUC? How can I be a safer person to talk to?'" There were mixed reactions to the pilot #YouBelong event on Wednesday, but the response seemed mostly positive. "I expected greater participation by those not on the panel," says Faith Omosor, senior biology and health sciences major who attended the event, "These guys were on the spot with the president and their professors sitting there staring at them. It would have been nice to give others a chance to share their perspectives, as well." Madison Greene, senior psychology major, was pleased to hear Angwin’s rich community of mixed faiths and perspectives mentioned near the end of the evening. "I work at the College Market, and I interact with a lot of the community who are not necessarily connected to the college," she says. "It's good to be reminded it's not just us here, just like it’s not just Adventists who attend PUC." Weems and Musvosvi emphasize these events are not debates, but simply to give a platform to those who rarely have the opportunity to share their stories. "No one knows it all," Musvosvi states. "We need a strong foundation of understanding so when someone calls us out, we can truly understand why what we did was a problem and strive to do better in the future." #YouBelong PUC Talks topics will be announced via campus posters. All events take place in the Fireside Room at 8:30 p.m. on Wednesdays; all are invited to stay for free food following the conversation, and students can earn two worship credits for attending. If you have questions about #YouBelong PUC Talks events, contact Weems (mjweems@puc.edu) or Musvosvi (ammusvosvi@puc.edu).